Synthetic peptide (the amino acid sequence is considered to be commercially sensitive) within Human ErbB 2 aa 1200 to the C-terminus (phospho Y1248). The exact sequence is proprietary. (ab214275 recognizes both phospho and non-phospho ErbB2). WB: Human ErbB 2 fragment recombinant protein; human breast cancer lysate; HeLa, A431, SK-BR-3, C6 and PC-12 whole cell lysates. IHC-P: Human breast cancer tissue. ICC/IF: SK-BR-3 cells. Flow Cyt: SK-BR-3 cells. IP: HeLa whole cell lysate. Our Abpromise guarantee covers the use of ab214275 in the following tested applications. IHC-P 1/4000. Perform heat mediated antigen retrieval with Tris/EDTA buffer pH 9.0 before commencing with IHC staining protocol. WB 1/1000. Detects a band of approximately 180 kDa (predicted molecular weight: 137 kDa). In the nucleus is involved in transcriptional regulation. Associates with the 5'-TCAAATTC-3' sequence in the PTGS2/COX-2 promoter and activates its transcription. Implicated in transcriptional activation of CDKN1A; the function involves STAT3 and SRC. Involved in the transcription of rRNA genes by RNA Pol I and enhances protein synthesis and cell growth. Chromosomal aberrations involving ERBB2 may be a cause gastric cancer. Deletions within 17q12 region producing fusion transcripts with CDK12, leading to CDK12-ERBB2 fusion leading to truncated CDK12 protein not in-frame with ERBB2. Belongs to the protein kinase superfamily. Tyr protein kinase family. EGF receptor subfamily. Autophosphorylated. Autophosphorylation occurs in trans, i.e. one subunit of the dimeric receptor phosphorylates tyrosine residues on the other subunit (Probable). Ligand-binding increases phosphorylation on tyrosine residues (PubMed:27134172). Signaling via SEMA4C promotes phosphorylation at Tyr-1248 (PubMed:17554007). Dephosphorylated by PTPN12 (PubMed:27134172). Cytoplasm. Nucleus and Cell membrane. Cytoplasm, perinuclear region. Nucleus. Translocation to the nucleus requires endocytosis, probably endosomal sorting and is mediated by importin beta-1/KPNB1. 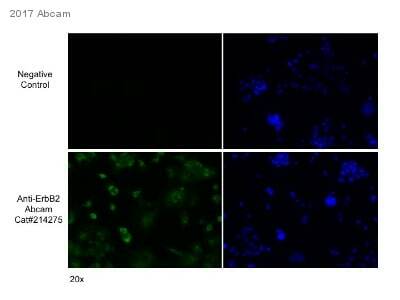 Immunofluorescent analysis of 100% methanol-fixed SK-BR-3 (Human mammary gland adenocarcinoma cell line) cells labeling ErbB 2 with ab214275 at 1/250 dilution, followed by Goat Anti-Rabbit IgG (Alexa Fluor® 488) (ab150077) secondary antibody at 1/1000 dilution (green). Confocal image showing membrane staining on SK-BR-3 cells. Tubulin is detected with ab195889 Anti-alpha Tubulin antibody [DM1A] - Microtubule Marker (Alexa Fluor® 594) (red). Secondary antibody only control: Used PBS instead of primary antibody, secondary antibody is Goat anti-rabbit IgG (Alexa Fluor® 488) (ab150077) secondary antibody at 1/1000 dilution. Immunohistochemical analysis of paraffin-embedded Human breast cancer tissue labeling ErbB 2 with ab214275 at 1/4000 dilution, followed by Goat Anti-Rabbit IgG H&L (HRP) (ab97051) at 1/500 dilution. Membrane staining on Human breast cancer is observed [PMID: 18437174]. Secondary antibody only control: Used PBS instead of primary antibody, secondary antibody is ab97051 at 1/500 dilution. Lysates/proteins at 0.02 µg per lane. Human ErbB 2 fragment recombinant protein contains aa955-1255 with a His-Tag®; Human ErbB 4 fragment recombinant protein contains aa1000-1300 with a His-Tag®. Observed band size: 180 kDa why is the actual band size different from the predicted? The molecular weight is consist with literature PMID :15741050. Exposure time: Lane 1: 3 minutes; Lane 2: 3 seconds; Lane 3: 10 seconds. The molecular weight observed is consistent with the literature PMID :15741050. Immunohistochemical analysis of paraffin-embedded Human breast tissue labeling ErbB 2 with ab214275 at 1/4000 dilution, followed by Goat Anti-Rabbit IgG H&L (HRP) (ab97051) at 1/500 dilution. Negative control: No staining on normal Human breast [PMID: 15150568]. Flow cytometric analysis of 4% paraformaldehyde-fixed SK-BR-3 (Human mammary gland adenocarcinoma cell line) cells labeling ErbB 2 with ab214275 at 1/60 dilution (red) compared with a Rabbit IgG,monoclonal [EPR25A] - Isotype control (ab172730) (black) and an unlabelled control (cells without incubation with primary antibody and secondary antibody) (blue). Goat anti Rabbit IgG (Alexa Fluor® 488) at 1/2000 dilution was used as the secondary antibody. ErbB 2 was immunoprecipitated from 0.35 mg of HeLa (Human epithelial cell line from cervix adenocarcinoma) whole cell lysate with ab214275 at 1/30 dilution. 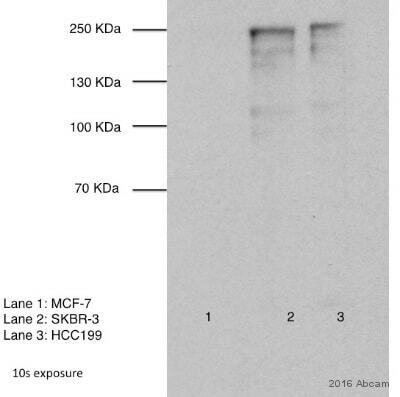 Western blot was performed from the immunoprecipitate using ab214275 at 1/1000 dilution. Lane 1: HeLa whole cell lysate 10µg (Input). Lane 2: ab214275 IP in HeLa whole cell lysate. Lane 3: Rabbit monoclonal IgG (ab172730) instead of ab214275 in HeLa whole cell lysate. ab214275 has not yet been referenced specifically in any publications. Publishing research using ab214275? Please let us know so that we can cite the reference in this datasheet.